Haven’t decided on a hotel yet? You can look at other available hotels in the Abruzzo region with Booking.com. 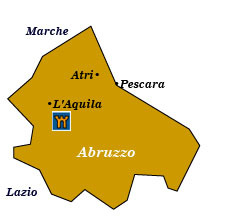 The Abruzzo region offers visitors some of the most wild and unpopulated landscapes of Italy. Here you’ll find two of the highest peaks of the Apennine Mountains, national parks filled with pristine forests and wildlife. Although less developed than the rest of Italy, hilltop villages and castle ruins underscore man’s presence over the centuries. Grand cultural monuments my be few, but if you’re looking for a peaceful holiday surrounded by nature, Abruzzo can be just the right choice. Parco Nazionale del Gran Sasso e Monti della Laga One of Italy’s biggest national parks at 1500 square kilometers, the Calderone (Europe’s southernmost glacier) is a highlight. Hikers can tackle Corno Grande, the highest peak in the Apennines at 2914 meters. Parco Nazionale della Majella Black bears, wolves, and chamois live among the 60 mountains in this park. Parco Nazionale d’Abruzzo, Lazio, e Molise The most popular of the region’s parks, here you can enjoy rivers, lakes, and forests nestled in the mountainous landscape. Formerly a royal hunting reserve, 66 species of mammals (including wild bears), 230 species of birds, and 2000 types of plants are now protected. Hiking trails of all levels, riding, and climbing are great ways to enjoy the nature here. In this small city, you’ll find a 16th-century Renaissance castle, known as the Forte Spagnolo, now a museum—the Museo Nazionale d’Abruzzo—filled with religious works, Roman artifacts, and a prehistoric mammoth discovered nearby. Although earthquakes have destroyed many original churches, the Basilica di Santa Maria di Collemaggio (crowning locale and tomb of Pope Celestine V) and the Basilica di San Bernardino are worthy of visits. La Perdonanza Celestiniana If you’re lucky to be near here on 28 August, you can watch the 1000-person costumed procession and join in the week-long celebrations in honor of the the “Pardon,” a famous act attributed to Pope Celestine V in 1294. Atri Stepped streets and passageways wind past brick and stone churches and houses. At the 13th-century Duomo, built on the site of a Roman bath, you can view remnants of the original mosaic floor, as well as the great 15th-century fresco cycle of Andrea Delitio. Scanno In a lovely setting and full of tradition, Scanno’s tiny churches and ancient mansions are found along its alleys and steep steps. Sulmona This lovely mountain town is said to have pre-Roman origins. The historic center is filled with Gothic and Renaissance architecture, fountains, and inviting piazzas. Sulmona was the birthplace (43 BC) of the Latin poet Ovid, but its present-day fame comes from its production of confetti, sugar almonds given to guests at Italian weddings. Ancient castles Because of its strategic position between the Tyrrhennian and Adriatic seas, fortresses were built to provide protection from endless invaders. You’ll see castle ruins everywhere (there are 24 castles within 60 km of l’Aquila alone), and some of the more interesting ones to explore are in l’Aquila (see above), Ocre, Celano, and Rocca Calascio.